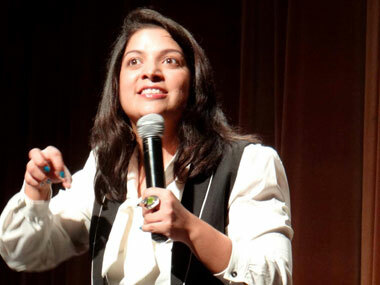 Aditi Mittal & Roastmaster – Karan Johar. What was interesting was that AIB were not notified, forced or threatened to pull the videos down (their YouTube channel and other videos are still up, thankfully). There are police complaints registered against them by Akhilesh Tiwari, president of Brahman Ekta Seva Sanstha in Mumbai, filed at Sakinaka police station but they haven’t been informed officially about any action against them. There are statements by Censor Board members (read: Ashoke Pandit) against them but the Maharashtra government has simply said that no moral policing would take place until it’s found that they have broken any law. While there is a huge hoopla going around this, they have brought those videos down (at the time of taking them off the views had touched 8 million and thumbs up outnumbered thumbs down by 10 to 1) because they didn’t want those associated with the videos – all those involved in the actual stage show to get hurt/affected (Aditi Mittal’s show has been cancelled). And here in lies the problem. While I would be really surprised that they would not have expected this backlash, especially since various religious groups have been unofficially doing moral policing of any kind of humour which is western-influenced or bordering on sexuality for some time now in India, they might not have expected that even the celebrities who were part of the event were likely to get hurt too. Hence they acted by bringing the videos down. As I write this article, there are different threads of debates going on mostly involving AIB and Karan Johar. The celebrities, as expected, have simply asked those enforcing moral policing to piss off (Not your cup of tea...don't drink it!!! - Karan Johar (@karanjohar)). But the full episode of this incident is still to be played out and we shall see that soon. This incident follows many other which have taken place in the past year in India and abroad where satirical humour has been pushed back, by violent means like attacking the office of French satirical magazine – Charlie Hebdo; and some not so violent means. The comedy groups – AIB and The Viral Fever (TVF) had been pulled up during the run up to the 2014 Lok Sabha Elections in India when they were making satirical videos on politicians because yes, the politicians, let’s just say, couldn’t take it. There were debates on various news channels, most notably on Times Now where Arnab Goswami had invited representatives from these groups and spokespersons of political outfits. AIB’s Shakya, poor lad, had to not only defend himself in front of the ear shattering noise of Arnab but also educate those spokespersons to have a good laugh. The situation then was different. They had joked about some people. Those ‘some people’ didn’t like it. So they revolted. It is similar to when in college you make fun of a fellow student or play a prank. If the person doesn’t like it, he / she revolts. You either laugh it off or don’t make any further jokes on that person (if you fear that person or care for that person too much) or you ignore his revolts (if you think you can’t be harmed by that person). But the AIB Roast case is different. The person being made fun off chose to be part of the event. In fact, he was there when the event took place. And he wasn’t alone. He brought his girlfriend along too, because, you guessed it right; she was made fun off too. And wait, his friends weren’t spared too. Even they were ridiculed but they were at the event too. And they too had agreed to attend it. What did they do while all those filthy jokes were being heckled at them? They simply laughed it off and happily walked off after the show. They chose to loosen up, take jokes lightly and laugh on themselves. For a community which is known to be snobberies and touch-me-not-I’m-a-celebrity kinds, it was delightful to see them shake those rumours off. A thumbs up to Bollywood! So if those making the jokes and those being joked about were present at the event (incidently all parties – AIB team, Karan Johar, Arjun Kapoor, Ranveer Singh, Rajeev Masand, Raghu Ram and Aditi Mittal made jokes upon each other, no one was spared) and have no complaints, why do the “3rd parties”; the people who have no relation to any of the involved parties and who have no say in the way the involved parties should behave, have complaints? To understand this, we also need to understand the progress of the world around them and influence of that progress. Availability of information, dissipation of media and access to that has reached a point of neutrality. Internet has ensured that information is available abundantly. Social media has made sure that any media after creation, can be released and made “viral” (i.e. accessed by hundreds and thousands) in a matter of seconds. And advent of smartphones has ensured that access to that “media content” is seamless. So a video made by a group of stand-up comedians can be “viewed” by millions in a matter of days. So a false rumour through social media channels that all people from a certain part of the country living in a particular Indian city would be targeted would make those people flee that city and possibly cause a riot. Its this neutrality that the people who are complaining against the AIB Roast are fearing. It’s a classic case of one having had a particular kind of education and upbringing where these kind of jokes were frowned upon and forcing that kind of mindset on all people around. So you start bossing around. Does the censor board have any say on content that is being published on youtube? The content had disclaimers, adult flags. So much so, that at the beginning, the Roast Master – Karan Johar says that if you can’t handle filthy jokes, you can simply switch off. Yes, Mr. complainer, you can switch it off. But you choose to complain. Why? Because you think its bad influence. Then why do you not complain about the hate speeches by political outfits? Just because the community participating in the AIB Roast are easy targets, you complain about them. Isn’t this hypocritical? I remember one of the shows of Comedy Nights with Kapil where the guest was Yo Yo Honey Singh (I know it’s a crude example but its apt in this situation. Episode). When an elderly gentleman from the crowd said that Honey Singh’s songs were a bad influence on his son, Honey Singh gave a superb reply. He said that when the gentleman was young, he used to listen to songs like “chalkaye jaam” etc. which celebrate alcohol consumption, then why complain about his songs like “Chaar Botal Vodka” where alcohol consumption is celebrated. So, my friend, it’s all hypocrisy. You would complain about some lads who were trying to lighten our day by asking people to take themselves lightly. But you won’t complain about those who instigate fighting amongst communities who are probably right now living in harmony. You would enjoy songs and shows which celebrate alcohol consumption but complain when these songs are heard by your kids. Instead of educating your kids, you would seek ban of that artist. Just because these artists, the celebrities, are easy targets you choose to file cases against them. Why? Maybe you seek limelight. The limelight, that comes with taking on a big personality. Maybe you feel that your agenda (external or internal) is wronged. Maybe your favourite artist was being made fun off and you couldn’t take it. But that gives you no right to boss around these stand up comics.